Every Mother's Day weekend for the last six years, I have stayed up all night, walking in circles with hundreds of other volunteers. Sound nuts? You'd be wrong if you thought so. We are among thousands who are willing to form teams and spend months raising money for cancer research. We don't want even one more person to hear those dreaded words, "You have cancer" ever again! So, we walk. All night. Year-after-year. Know what else? We have fun doing it! My team is called the Plum Crazy Cruizers. Most of us are members of the same Red Hat Chapter, some are friends and family who join us in our fight to find a cure. Together we are awesome. We are fun-loving. We are committed. What is Relay For Life Anyway? We each have our own reasons for Relaying. Our own history with cancer. Some of us are cancer Survivors. (Yahoo!) Some of us are battling cancer now. (BooHoo!) Some of us have lost loved ones to cancer. (Sadness!) 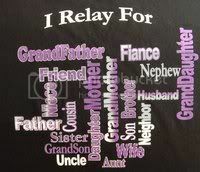 We Relay for a Mother, a Father, a Sister, a Brother, a Daughter or Son, and so on. You know. Nearly everyone knows someone who has been touched by this monster, cancer. So we walk around a track lit by candles in luminaria bags. Each bag has the name of someone who knows cancer by its first name - Trouble! The luminarias are In Memory of, In Support of, In Honor of a loved one. Thousands of tiny candles to light up the night while we walk, and walk, and walk some more. Why do I Relay? I Relay for myself, my HB (HoneyBunny), my Mom, my Dad, my Sister, my Sister-in-Law, my friends, and for YOU. Do you Relay? You can find an event near you at Relay For Life.org. Thanks for the sweet comment! Very well said! Pat, What a wonderful thing to do. We will be having a race here in Savannah. I can't run but I can give of what I have. Ginger - It is one of those things that grabs you and won't let go. Both HB and I have has skin cancer, and while to us that seems minor, cancer is cancer, and we are survivors as much as someone who had to undergo chemo and radiation. It runs in both of our families. If our walk at Relay helps in some small way, I will be happy. Cindy - It truly is an amazing event for all ages and abilities. My hospital has our own team. It's so much fun for such an important cause. 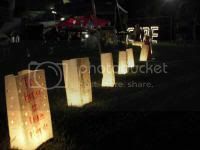 I love the luminaries and usually many in memory of or in honor of my friends and family. So glad we all can be a part in our various places in the country. Janet - Ours in May 11th & I'll be thinking of you. My favorite time in the middle of the night when I can take the time to read all the names on the luminaria bags. Katherine - This is one of my passions. Cancer runs in our families, so I want to my small part to help find a cure. Yes, please. emailing you now.